I’m already licking my lips in anticipation of the foodie delights being lined up by P&O Cruises for its newest and biggest ship, Britannia. While we wait for revelations about the ship’s godmother and the launch celebrations planned for next March, the P&O powers-that-be are dishing out other details in bite-sized pieces. As well as the cookery school and the Food Heroes introduced a couple of months ago, some new treats were announced recently – see page 8 of this issue. But on top of the lashings of chocolate, cheese and charcuterie, the wines, beers, Champagne and gin, there’s even more to get the gastronomic juices flowing. Eric Lanlard’s Market Cafe in Britannia’s atrium promises to be too good to miss, and I’m looking forward to discovering what Marco Pierre White has cooked up for the gala dinner menus. P&O marketing director Christopher Edgington is talking about his company’s new ship as “this extraordinary girl”. Perhaps he was overcome by the 30 varieties of chocolate he had to taste before coming to a final selection. But the passion for food won’t be confined to Britannia’s restaurants and bars. Epicurean delights are being lined up at selected destinations along the way. In the Spanish port of La Coruna, for example, Michelin-starred chef Atul Kochhar will lead an excursion to the bustling market to hear all about the Galician fishing industry. Joining the tour will be Sven Kretzschmer, head chef of the city’s most famous restaurant, Mirador de San Pedro. Together, the chefs will describe the varieties of fish on sale and demonstrate the preparation processes required to bring the seafood to the table. Inevitably, guests will enjoy a seafood lunch at Sven’s restaurant, overlooking the Atlantic. On the island of St Lucia, Marco Pierre White will join passengers on an excursion to a restaurant in Soufriere, where he and local celebrity chef Orlando Satchell will put together a mouth-watering five-course Caribbean lunch. There will also be a tour of a banana plantation and a visit to a bakery to see production of cassava bread. In Tuscany there will be visits to the family-run Martelli’s pasta producer, while from Civitavecchia an excursion will operate to the Antica Cantina Leonardi winery on the shores of Lake Bolsena. Wine tasting also features on a trip to two vineyards on the French island of Corsica. It would be wonderful to join a wine tour hosted by TV’s entertaining Olly Smith, but as far as I can see, he has so far committed to only one Britannia cruise in 2015 – to Portugal and Spain, departing from Southampton on 2May. Saturday Kitchen’s James Martin will be the year’s most-travelled chef. He will be aboard Britannia’s maiden voyage leaving on 14 March and four further cruises during the year. On the 12-night round-Britain cruise in July he will be joined by two other celebrity chefs whose identities have yet to be confirmed. 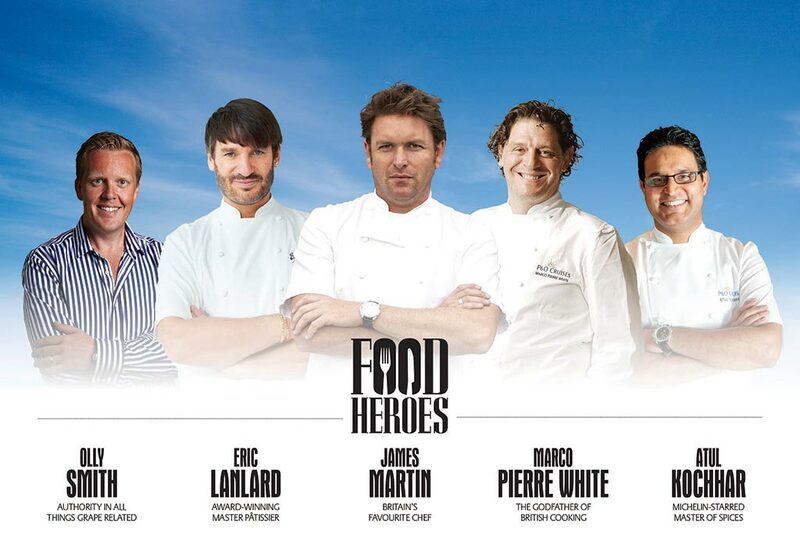 Cake Boy Eric Lanlard joins James on the maiden voyage and will also sail in May, September and October. Atul’s one cruise of the year is in April, and Marco will also be on board for a Baltic cruise in May. I detect the hand of P&O’s gourmet PR supremo, Michele Andjel, in many of these innovations. An enthusiastic amateur cook and baker, she is using her own love of food to influence Britannia’s offerings. At the dinner when some of these details were announced, I was also impressed to find Christopher Edgington reacting positively to a suggestion from food writer Xanthe Clay to have local specialities added to the menu on Britannia’s travels. One immediate suggestion was borscht in St Petersburg; let’s hope we also see authentic pizzas in Naples, bouillabaisse in Marseilles, and Irish stew in the Emerald Isle. All I have to do now is persuade P&O to appoint me the resident food taster, and provide me with an ever-expanding wardrobe.